At almost any restaurants or café you go to in Safed, you will see either a blue or a pink certificate on display. This is a sign that the place is under the kosher supervision of the Rabbinical Authority of Safed, headed by Rabbi Shmuel Eliyahu and Rabbi Bistritsky. All kosher restaurants are either Meat or Dairy and either may serve fish which is considered parve or neutral. 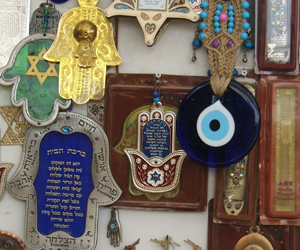 In Safed there are two levels of supervision, the regular rabbinical certificate which is colored pink and the stricter level of supervision called mehadrin, which follows stricter guidelines, mainly concerned with which products or hechshers are permitted, and this certificate is blue. Restaurants with a mehadrin certificate are not allowed to be open on fast days, whereas those with a regular certificate only have to be closed on Tisha b'Av and Yom Kippur. All kosher restaurants must be closed on Shabbat. Hotel restaurants that are kosher have special arrangements for keeping food hot on Shabbat, as the preparing and cooking has to be done in advance. The restaurants in Safed pay the rabbinical authority (Rabbinut) for the level of supervision they want and the Rabbinut provides a supervisor or mashgiach to check that the restaurant or café is keeping to the relevant requirements. This supervisor will do regular daily spot checks on the premises, make sure that staff understand the kashrut and even do things like check rice for bugs, as bugs are not permitted according to kosher laws. Certificates are normally granted for 3 months and show the period that they are valid for. Due to the extra work involved in making restaurants ‘kosher for Pessach' many proprietors choose to remain closed during this time. Restaurateurs who do want to be open for the week of Pessach need a special hechsher, and all establishments need certificates to show either that the ‘chametz' (leavened products) was sold or that it was completely disposed of it. In Safed the Rabbinical authority follows the Sephardic tradition of keeping fish and dairy separate and therefore restaurants are not allowed to serve them together. So if you want, for example, bagels with lox and cream cheese you have to have one of those products on the side. Some restaurants may not have kosher certification because they are open on Shabbat, and/or because the food they serve isn't kosher. For example, they may serve dairy and meat products from the same kitchen. As the cost of the supervision can be expensive for a small business, some kiosks which serve drinks or snacks may not have kosher certificates but are still kosher and are very well known to their local clients and are trusted by them. It is very easy to find somewhere to eat in Israel if you are vegetarian as all kosher dairy restaurants are by definition vegetarian. To learn more about kashrut or to find out about restaurants and cafes in Safed look at the individual entries in our Places To Eat section on this website.